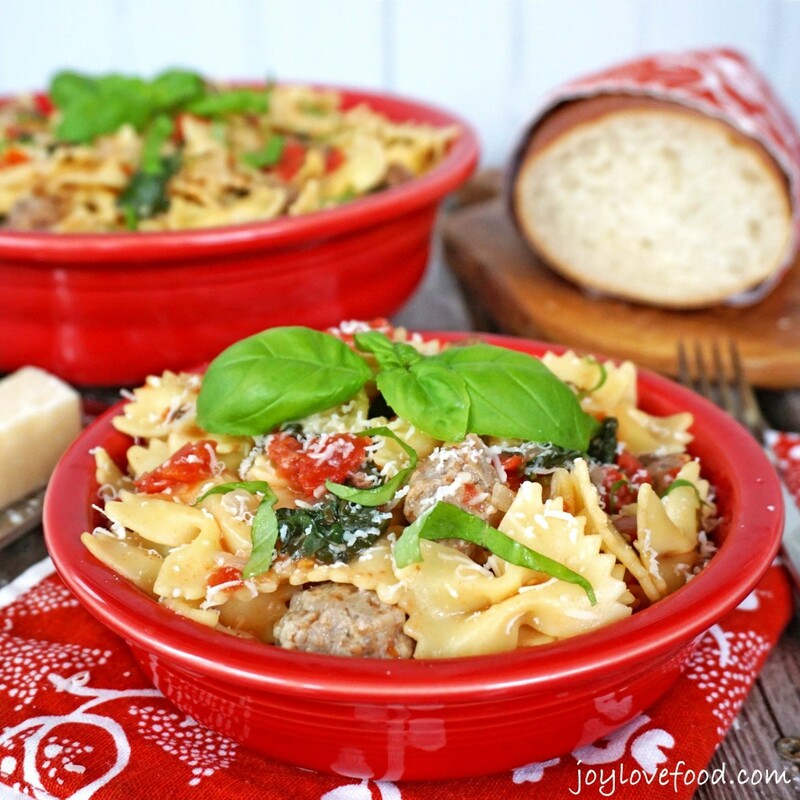 One Pot Pasta with Tomatoes, Sausage and Kale – a delicious one pot meal, perfect for a quick and easy family dinner or entertaining guests during the busy holiday season. I’ve mentioned, that with three young kids, each involved in various activities, that we have a busy schedule. Now that we are in the midst of the holiday season, things are even busier with all the fun seasonal activities added into the mix. So, now more than ever, I rely on quick and easy options for getting a delicious family dinner onto the table, such as one pot pasta dishes. 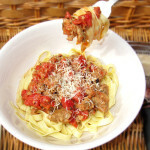 I love one pot pasta dishes, the whole meal is prepared in one pot, no separate pasta pot and strainer needed. There are so many wonderful variations of one pot pasta dishes; today I’m sharing one of our new favorites, this delicious One Pot Pasta with Tomatoes, Sausage and Kale. This past week, while my twin 3.5-year olds girls and I were doing our weekly grocery shopping at Walmart, I picked up the ingredients for my One Pot Pasta with Tomatoes, Sausage and Kale, to have on hand for an easy dinner this week. One of the key ingredients to this one pot pasta dish is Hunt’s Diced Tomatoes, they are located in the Tomato Sauce aisle. I also picked up pasta, chicken broth, mild Italian sausage and Parmesan cheese. In the produce section at Walmart, I picked up some baby kale, fresh basil, garlic and onions that I would need for my One Pot Pasta with Tomatoes, Sausage and Kale. 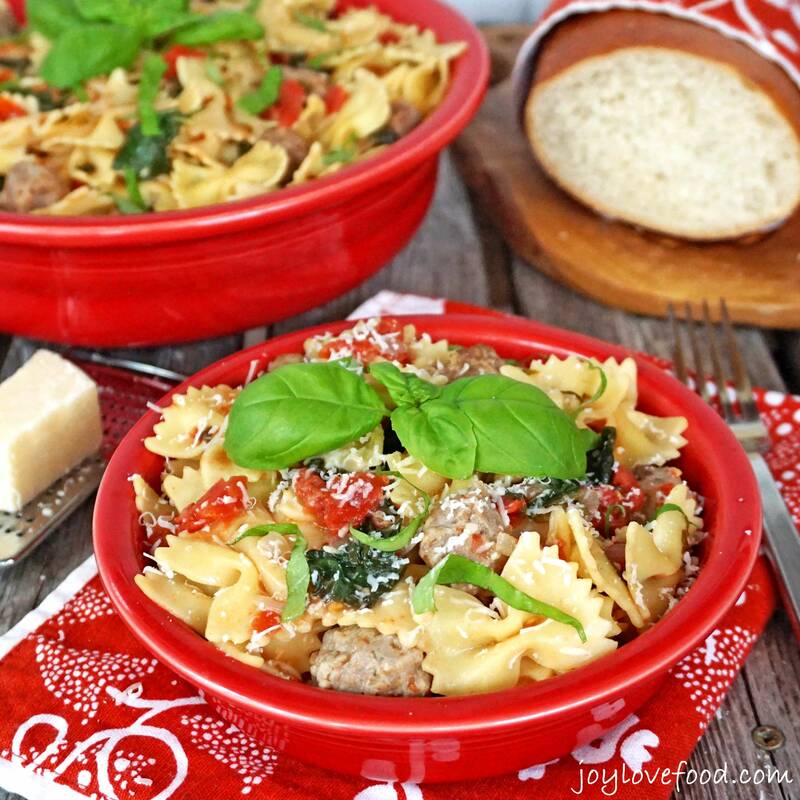 With all the veggies, pasta and sausage, this One Pot Pasta with Tomatoes Sausage and Kale, is truly a one pot meal; I also like to serve it with some fresh bread. So, in the bakery section at Walmart, I also selected a nice loaf of freshly baked crusty bread. Yesterday, I needed to get a quick and easy dinner on the table. So, I assembled the ingredients needed for my One Pot Pasta with Tomatoes, Sausage and Kale, including Hunt’s Diced Tomatoes, chicken broth, pasta, sausage, baby kale, fresh basil, onions and garlic. I then removed the sausage from its casings and shaped it into small balls. Next, I heated the olive oil in a Dutch oven over medium heat and added the onions and garlic, which I sautéed for a few minutes, until softened. I then added the sausage and sautéed until no longer pink, about seven minutes. Then, I added the Hunt’s Diced Tomatoes, chicken broth, fresh basil and pasta. I gave the mixture a good stir to make sure the pasta was submerged. Then, I increased the heat to high and waited until the mixture came to a boil, about three more minutes. Then, I covered the pot and reduced the heat to medium low and simmered for 11-12 mintutes, until the pasta was al dente. I removed the lid, and added the kale, a handful at a time, stirring to incorporate. I turned off the heat and let the pot stand for 5 minutes, to allow time for any remaining liquid to be absorbed by the pasta. Finally, I seasoned the pasta with salt and pepper. In just about 30 minutes, this One Pot Pasta with Tomatoes, Sausage and Kale is ready to serve, and a delicious family dinner is on the table. A nice loaf of crusty bread is the perfect accompaniment to this easy, satisfying pasta dish. I like to keep some cans of Hunt’s Diced Tomatoes on hand to create one pot pasta dishes, such as this One Pot Pasta with Tomatoes, Sausage and Kale. One pot pasta dishes are perfect for easy family dinners. I also like to make them when I’m entertaining out of town guests during the holidays. This past weekend and week prior, my parents were staying with us for the Thanksgiving holiday. 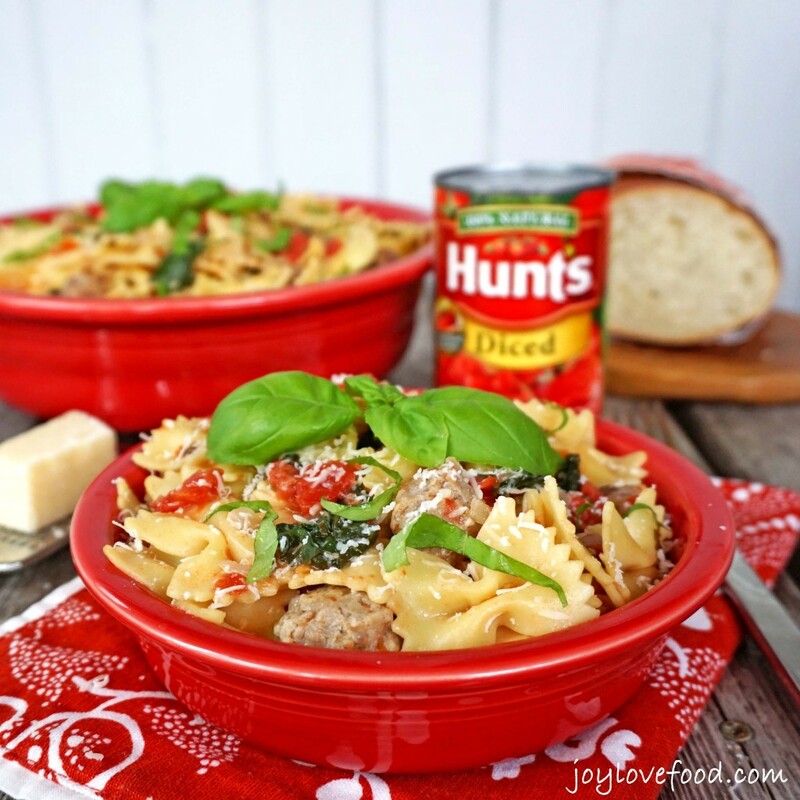 All of our focus was on preparing for the main holiday meal, however we still needed to have dinner on the other days, and I was happy to have some Hunt’s Diced Tomatoes in the pantry to whip up a quick and easy one pot pasta dish for dinner on Saturday evening. This quick and easy One Pot Pasta with Tomatoes, Sausage and Kale is perfect for a delicious family dinner. 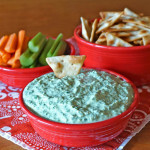 It is also great for a stress-free meal when entertaining guests during the busy holiday season. What is your favorite quick and easy one pot dish? Please let me know in the comments below! And, be sure to visit Yes! 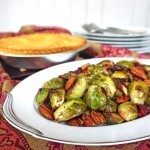 You Can for more quick and easy seasonal recipes and tips. For even more great ideas, visit Hunt’s on Pinterest and Facebook. 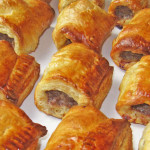 Remove sausage from casings, using hands form into small balls. Heat olive oil in a Dutch oven or stock pot over medium heat. Add onions and garlic, sauté until softened, about 3 minutes. Add sausage to Dutch oven, sauté until no longer pink, about 7 minutes. Add tomatoes, broth, basil and pasta to Dutch oven. Stir to combine and ensure pasta is submerged. Increase heat to high and bring mixture to a boil, this may take about 3 mintues. Cover Dutch oven and reduce heat to medium low. Simmer for 11-12 minutes or until pasta is al dente. Remove lid. Add kale by the handful, stirring to combine. Turn off heat and let mixture in Dutch oven stand for 5 minutes, this will allow for any remaining liquid to be absorbed by the pasta. Serve immediately, garnish with additional chopped basil and top with Parmesan cheese, if desired. 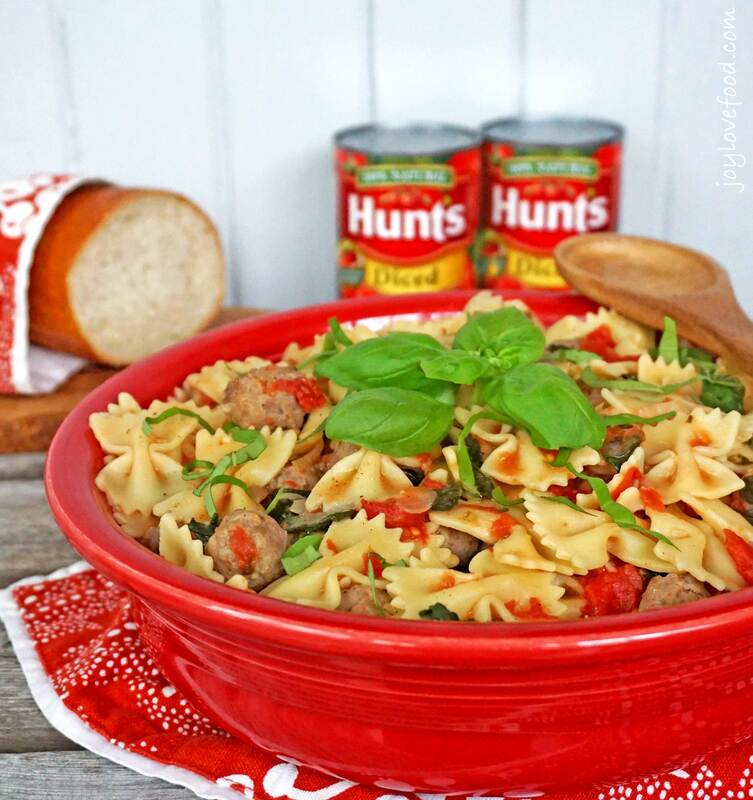 This entry was posted in Main Dishes and tagged dinner, easy, entertaining, fall, family dinner, holidays, kale, one pot dinner, one pot meal, one pot pasta, pasta, quick, sausage, tomatoes. Another great recipe and fairly easy too being all in one pot! Perfect for a work night! Thanks for sharing on My 2 Favorite Things on Thursday and I hope to see you tomorrow! Pinned! Looks delicious! One-pot meals are just the best especially for busy week days. 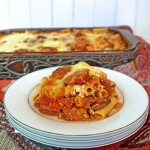 Your One Pot Pasta dish looks awesome! Thanks so much for sharing your talent with Full Plate Thursday and have a great day. Great recipe! I would love to try this one, one pot meals are my favorite and this one looks so comforting and delicious! Oh my! I will have to try this with some gluten free pasta…perfection! Maureen recently posted…How Do You Decorate Your Christmas Tree? One pot is where it’s at! This is so funny! My daughter was just talking about wanting dish with sausage and kale in it! Now I have a recipe for us to try. I think one pot pasta is the best thing ever. Intense flavors and creamy pasta… yummmmm! Ooooh, please can I borrow your idea for my supper tonight? I’m just coming into loving one pot meals!! Especially because like you I have two very busy little ones so getting dinner put on the table quick is necessary at times! Yum! What a delicious fresh bowl of pasta! I’m loving this ! I make a similar version of this with spinach and a little touch of cream at the end. Thanks for the reminder to make it more often. Looks amazing and so simple! Thank you for sharing! This looks fantastic! I am drooling! Looks super tasty – a great cold weather dish! We love Hunts diced tomatoes. 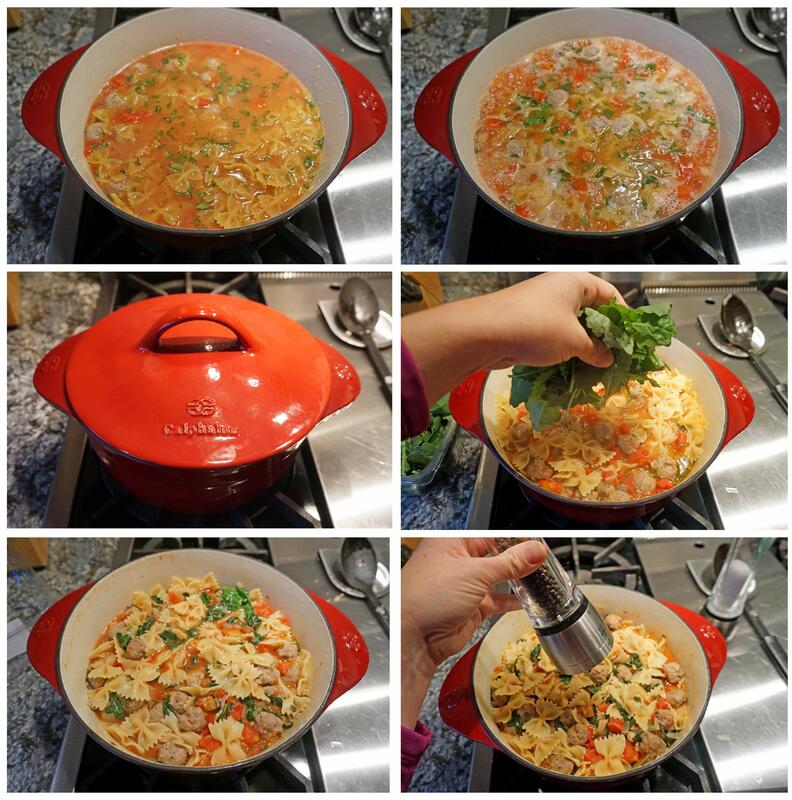 Your addition of kale into this one pot wonder is such a great idea; thanks for sharing! What a brilliant recipe, so easy and pretty! There are some days dinner just needs to be as fast as possible! 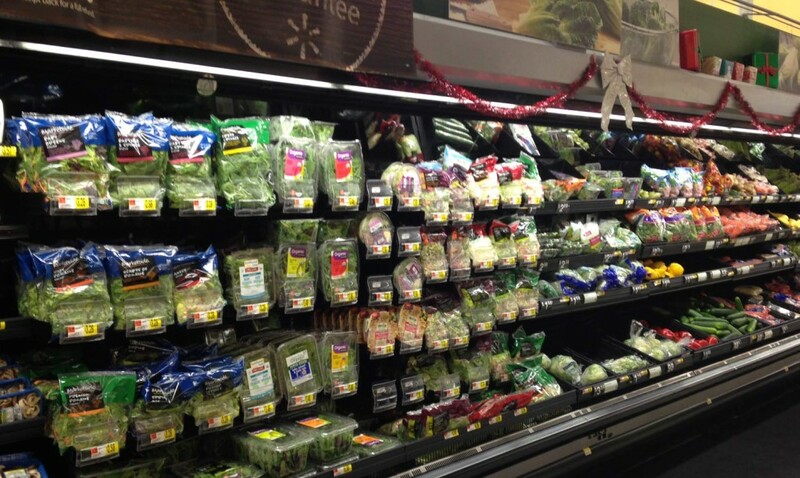 Easy meals during the busy holiday season is a lifesaver! This looks so good too. Putting this on my weekly meal plan! I NEED this recipe in my world. Thank you. It looks fabulous and I love the ease of putting it together. This is my kind of recipe, Joy. Canned tomatoes are a staple in my pantry. Love your pictures. Michelle @SimplifyLiveLove recently posted…DIY Christmas Gift Ideas for the Entire Family â over 30 ideas for all ages! I love one pot dinners like this! So perfect for a weeknight. 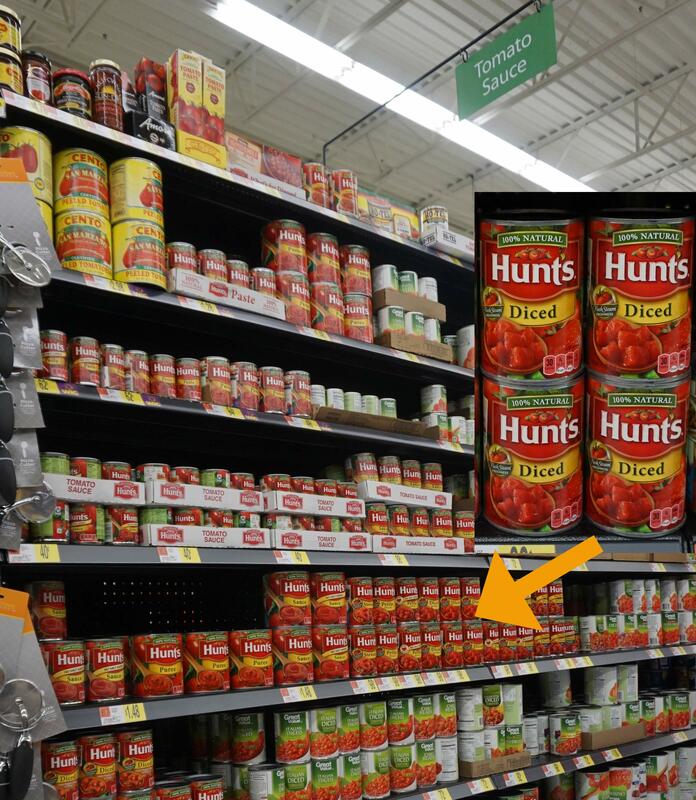 Hunts tomatoes are outstanding, I keep them stocked im my pantry too. Simple, filling, hearty and delicious. This is my kind of dinner all the way around! We love meals like this! 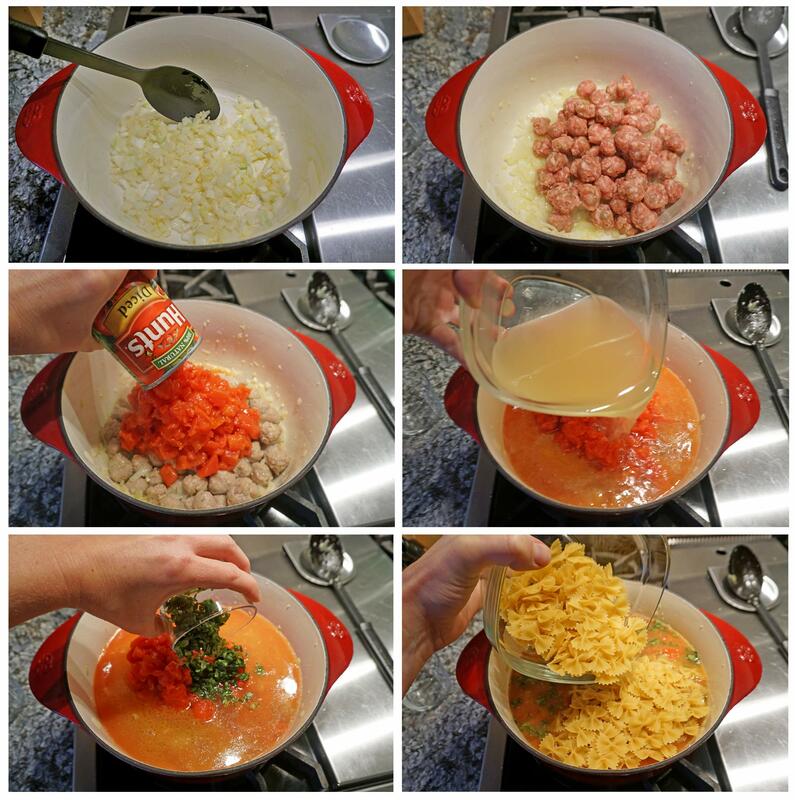 The pasta, sausage and kale are marvelous together with that sauce. This recipe looks so festive in your pretty red dutch oven! Sure do love that one pot cookin’. Added it to my one pot meals board! What a delicious weekday meal! 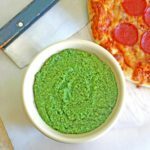 Easy and super tasty! Wow, this is one fantastic “one pan” dish. All the colors and flavors are divine. Great photo as well. Oh man, one pot meals are so appealing these days. Thanks for sharing this! It’s a good reminder to add sausage to my weekly shopping list to bring a little more variety to our meals. One pot meals are perfect for the whole family! Thanks for the recipe! All the ingredients together that I love! AND, I just looooove one-pot meals, especially this time of year 😉 Nice! I LOVE one pot meals. This looks great and we have A LOT of kale around here this time of year. Great way to eat some seasonal veggies! I am loving this combination for a pasta dish especially with the addition of kale. I also am a huge fan of one pot meals for those busy nights! Thanks Julia, it is really a great combination! I had my doubts in terms of either the pasta being overcooked or the dish being soupy, but this came out great! Joy! This sounds wonderful and Krista would think I was cooking healthy with the kale! LOL! Thanks for sharing this. Thanks Linda, I hope you give it a try and you and your family enjoy! I love one pot meals and this one sounds so tasty w/ the sausage. Thanks Christine, we love the sausage in this one! This looks so delicious and easy! Love it. Thanks Linda, it really is so easy and delicious!